Godzilla, King Of The Monsters, takes his revenge on us by acting in GODZILLA’S REVENGE and making us watch it, instead of letting us jump out a window to make the suffering end. 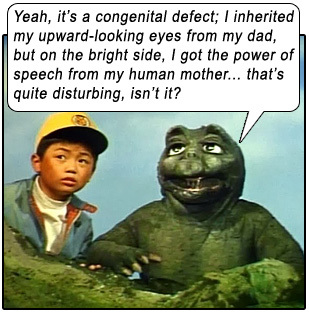 Longtime Godzilla filmmakers, director Ishiro Honda and writer Shin’ichi Sekizawa, try to exonerate themselves from the execrable creature fights in this film and overuse of stock footage from other Godzilla movies, by making the monster scenes the product of a boy’s imagination. Who exactly are they trying to fool? Newcomers to the series will marvel that the filmmakers were allowed to live after creating sequences so godawful, and inexplicable fanatics/aficionados of the zilla franchise will know exactly which bits were lifted from other films. Little Ichiro (Tomonori Yazaki) imagines he’s on Monster Island witnessing monster fights from a safe vantage point on a hill – and there he is! Stock footage ensues. Godzilla fighting a spider, a mantis, a lobster, a bird, etc. I’m about to pass out from the banality. Ichiro meets Minilla (or Minya, or Magilla, or something that sounds like Vanilla), a creature that resembles a lump of poo that claims to be Godzilla’s child (“Little Man” Machan). Oh yeah, it claims this not in grunts or gestures – in English (or Japanese, I guess, in the original). Hey, don’t lose your mind, critics: it’s the Boy’s Fantasy. In the real world, Ichiro must overcome kidnappers, neglectful parents, and school bullies. Backed by a Sesame Street soundtrack that just won’t quit. Ichiro uses visions from Monster Island (that are from his fantasies, mind you) to help him out of sticky situations with the kidnappers and the bullies. And venal marketers use these snippets to promote movie as a message about bullying (!). Ichiro cured himself of his fears. Freud was right: Godzilla is friend to children! Best part is when Ichiro cheers Godzilla as he destroys attacking planes. Yay! Another human pilot dead. Whee! There goes another pilot with no motivation on why he is firing on Godzilla on Monster Island; just following orders and being killed for no reason. Hooray! A pilot smashed to bits, who had a wife and family and dreamt of one day opening a sushi store. Yay! Another pilot who was just about to pay off his old parents’ house in Hokkaido, now dead at the hands of Godzilla. You go, Godzilla – kill those humans! Uh, wait, isn’t this misanthropic, to say the least? No, Godzilla is friend to children! 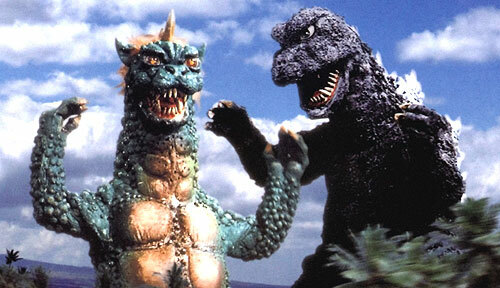 The nemesis of Godzilla and his scion is a reptilian-cat-thing named Gabara (but Ichiro’s English dubbing makes it sound like – inexplicably – “Gamera”). Second best part is when that poo blob is tortured into blowing fire. Maczilla cannot blow fire like his old man, so his old man steps on his son’s tail and, in pain-shock, Millbilly blows fire. Later when that reptilio-feline thing attacks, Ichiro drops a rock on Milli Vanilli ‘s tail to make him blow fire. That kooky soundtrack and Ichiro’s giggling tell us it’s not torture, it’s comedy. Because Godzilla is friend to children. I am in so much pain. You win, Godzilla. Your revenge is complete. aka: GOJIRA-MINIRA-GABARA: ORU KAIJU DAISHINGEKI. aka: GODZILLA, MINILLA, GABARA: ALL MONSTERS ATTACK. Starring: Tomonori Yazaki, Hideyo Amamoto, Sachio Sakai, Kazuo Suzuki, Kenji Sahara, Machiko Naka, Midori Uchiyama, ‘Little Man’ Machan. GODZILLA: Haruo Nakajima. GABARA: Yû Sekida.